I have never been satisfied with my bed, so I spent a lot of time figuring out what would make the ultimate bed and building it. My wife and I both have some lower back pain, and the bed you sleep on can make a huge difference in how much that affects you in the morning. Summary: I sleep on a two-layer foam bed. The top layer is two inches of "Sensus" 5 pound high-density viscoelastic from Foamex, and the base layer is three inches of "Q-41" polyurethane foam from Carpenter Foam. 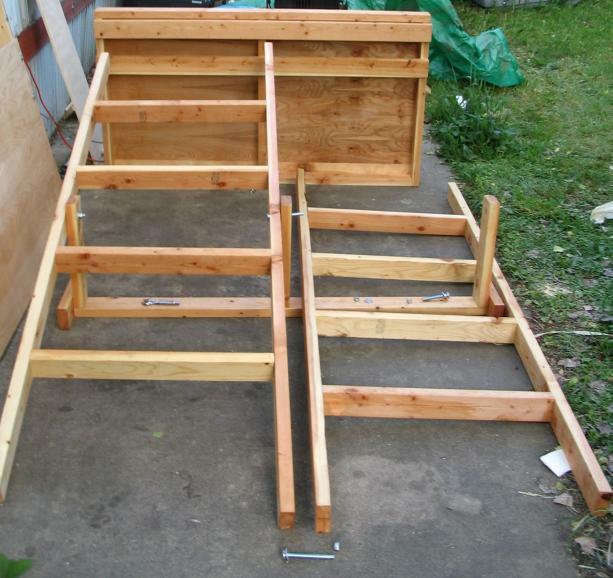 I built my own platform bed frame and have free plans and pictures of it. I highly recommend the Tempur-pedic original pillows. I have tried as many kinds of pillows as I could try, and I've never found anything that compares to The Original Swedish Neck Pillow from Tempur-pedic. I don't make any money if you buy a pillow from that link. A salesperson told me that most adults need the medium size, but if you have large or small shoulders go to a store that sells Tempur-pedic and make sure you get the right size for your shoulders. I have also been converted by my wife to the Church of Many Pillows, and sleep best with a regular cheap pillow between my knees, and another one between my arms in addition to my Tempur-pedic for my head. This is the price I pay for being a side sleeper. This part is fairly subjective, but I believe my custom design is the best mattress at any price if you like a medium to firm bed. 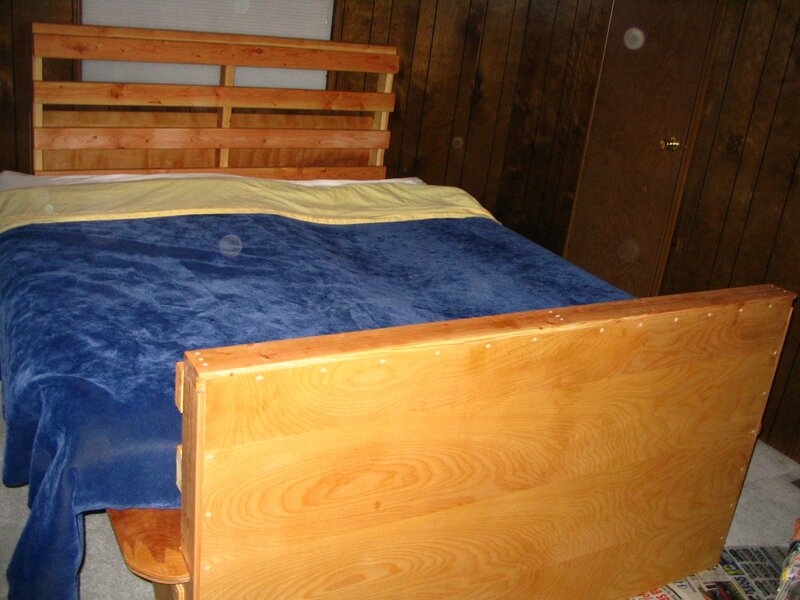 You don't want the mattress to sag, or support your weight more in the middle than the top and bottom. I call this the "hammock effect", because any mattress that doesn't have good support will sag like a hammock. A waterbed is the best example of what you don't want. I find that even the very best mattresses have this problem to some degree if you choose a soft mattress, which is one reason I like a very firm mattress. You don't want movement on one part of the mattress to transfer to another part. You want to be able to choose different softness for the two sides of a King. Some mattress aficionados believe the very best mattresses are high-end spring mattresses, and they may be right. However, in my opinion none of the spring mattresses within mortal budgets are nearly as nice as high-end foam. The ideal spring mattress is very difficult to construct, because you want the springs to act independently (avoiding the hammock effect and movement transfer), yet you have to hold them in place somehow. Also, it doesn't feel very nice to lie on springs, so you have to have a top surface connected to the springs, which usually takes aways their independence and leads to the two undesirable qualities. High quality foam, on the other hand, acts very much like an idealized spring mattress. My design uses two layers of foam. The top layer is a high-density (5 pound) viscoelastic ("memory") foam with the brand name Sensus from Foamex. The main thing you're looking for in a memory foam to sleep on is the density, the higher the better. I'm not sure of the explanation for why a high-density visco foam feels much better than a low-density visco foam, but I have tried both and it's night and day. This top layer foam is similar to the foam used in the Tempur-pedic foam mattresses, except that Tempur-pedic mattresses use about 8 inches of the stuff. I have not slept a full night on a Tempur-pedic, but what I felt in the store led me to believe they are too soft for good back support. Also, Tempur-pedic mattresses cost several thousand dollars, while my design costs $600-$800 for a king. I use two inches of the visco foam on my side of the bed, and three inches on my wife's side. With two inches you will have a very firm bed, and with three inches you will have a medium-firm bed. One thing to watch out for with visco foam is that it is very difficult to manufacture, there are still quality-control issues, and it doesn't last nearly as long as good polyurethane foam. I have seen many opinions on how long good visco foam should last, but the pessimistic ones go as low as two years. I have some Carpenter brand visco foam that has started to degrade slightly after three years. Another problem with foam, and especially visco foam, is lack of breathability. We use two cotton blankets between the foam and the bottom sheet, and we don't have a problem with it. If you sweat a lot, you may want to invest in a good wool topper instead. Wool is supposed to be the ultimate bed topper, but my wife is allergic to it. The base layer is three inches of high-quality polyurethane foam from Carpeter Foam called "Q-41", which is the "Qualux" line of foam with an IFD (firmness) of 41. "Why not just use five inches of that good memory foam? ", you're probably saying to yourself right now. Well, the memory foam (even the highest density) is too soft. If you have more than about three inches of it, you start to sink too much and get the hammock effect. At the same time, though, you don't want to just put three inches of visco foam on a platform bed frame, because you'll feel the platform through the foam on your hips and shoulders. This base layer keeps your body from sinking too deeply, but without feeling the platform. I suspect you could use two inches of the base foam and not tell any difference from three inches, I just tried three inches first and stuck with it because it works. The Q-41 is very firm foam, so you don't have to worry much about it sinking in if it's too thick. Also, the Q-41 should last a long, long, time (I have read at least 10 years even in a dry climate like Colorado). They usually use foam that is inferior to what I am recommending. If they are sown into a cover, it is difficult to replace just the memory foam, which is wasteful since the base foam will last much longer. The softness is the same on both sides of the mattress. They are almost always too thick. I bought my foam from foamsource.com. They are an online foam retailer, but they happen to be located where I live and allow pickup as well. I recommend you take the visco foam out of the plastic bag and air it out for a few weeks before you use it, otherwise you're going to breath some nasty foam-fumes. Foamsource.com also seems to have a pre-made mattress that's very similar to mine here [link now broken], except that it's too thick in my opinion, and I think they glue together the top and base layer, which means you have to replace the whole mattress when the visco wears out, and also means you can't change the top layer in case you decide you want a different thickness. A note on foam gluing and lamination: if you are building a king mattress, you should know that foam doesn't come in widths large enough for a king, so the foam retailer has to glue two pieces of foam together. They will tell you that this is nothing to worry about, but I have seen visco foam glued together like this start to come apart. The polyurethane foam (the Qualux base layer) seems to glue together very solidly. For this reason, I suggest having the retailer glue the base foam into one king-sized piece, but buying two half-king sized pieces for the top layer. There is no need to glue the visco top layer to the base layer (they may call this laminating). Both kinds of foam have a very sticky feel, and they stick so firmly together even without glue that you have to peel them apart after a while. The frame should be extremely sturdy. I like to sleep on the floor, so I want a bed that feels as solid as sleeping on the floor. If my wife tosses, I don't want to feel the world move beneath me. 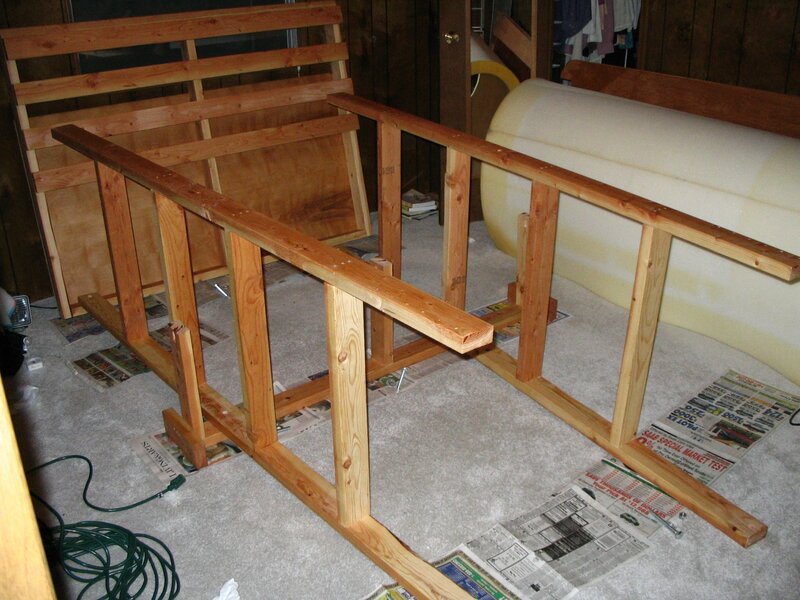 The frame should be made of wood, and use only natural products. The frame should break down into pieces that can be carried by a single person and fit through a normal door without taking the door hinges off. 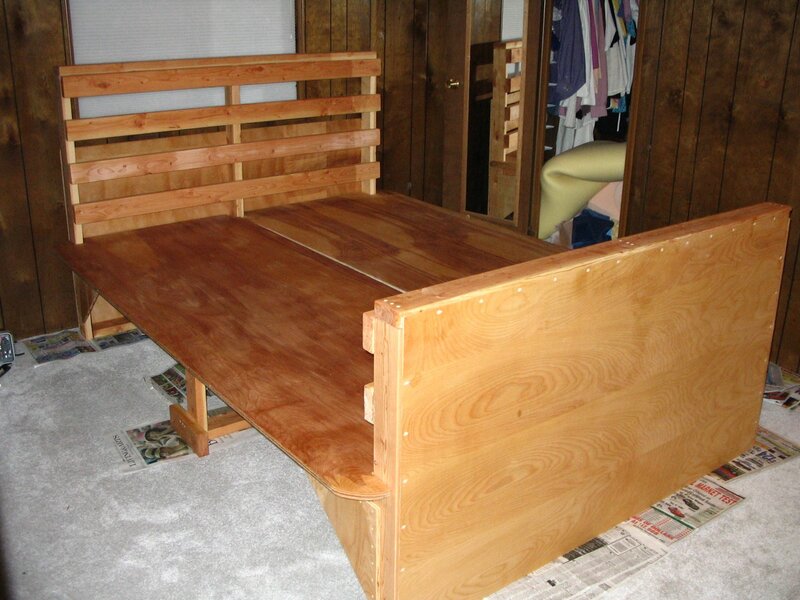 It should be a platform bed frame, since my mattress is foam. 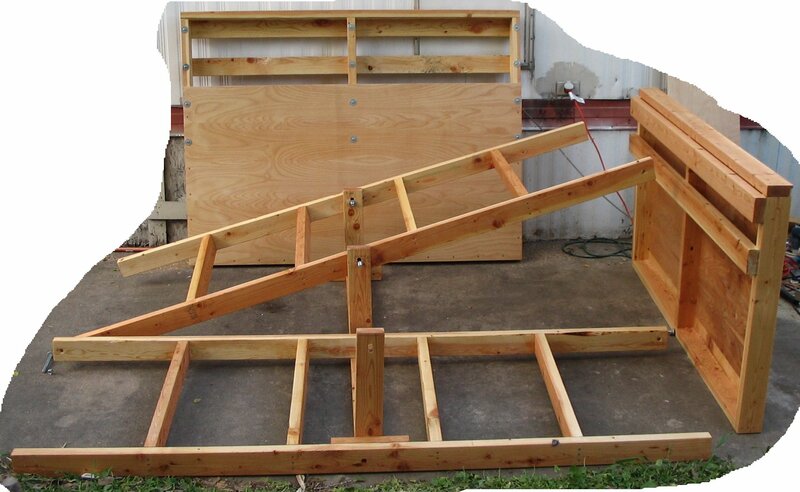 It should be built using basic woodworking tools: table saw, drill, and optionally a router. I like a big headboard and a smaller footboard. No real reason, that's just how I like it. I couldn't find anything on the market that made me happy and fit my requirements, so I designed my own. The platform bed plans are in DXF format, which almost all CAD programs support. I created the plans using QCad, a free and open source 2-D CAD program that is available for all the common operating systems. The platform bed plans zip file contains DXF views from front, back, overhead, and side. There are some features in these plans like fold-down sides that I didn't get around to building. These plans are available to you to copy, modify, and redistribute under the GNU General Public License. Here's what it looked like as I was building it, and in my room. It has all the qualities I listed above, and I have been very happy with it. The only complaint my wife has is that it's not big enough for her. It is a California King, but she wants the length of a California King and the width of an Eastern King. I used birch plywood and Douglas Fir 2x4s for most of the construction. I oiled everything heavily with Tung oil. Make sure you aren't bothered by the smell of Tung oil if you do this, because your room will smell like it for weeks. I kind of like the smell. There are about $600 worth of total materials and supplies that went into it. It is extremely sturdy, and also extremely heavy. I estimate it weighs 250 pounds without the mattress. 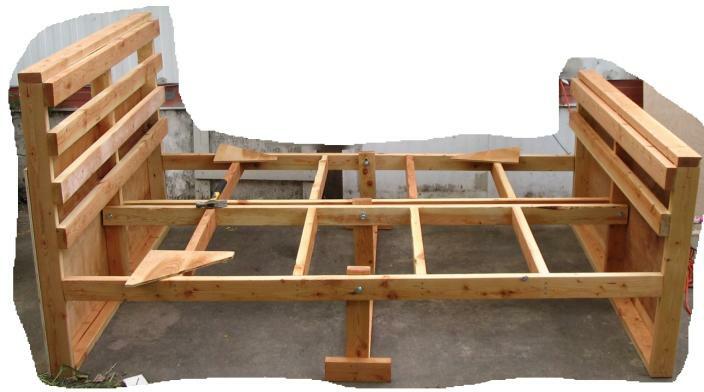 It breaks down into seven easily movable pieces, though, so the heaviness is not a problem unless you move your bed around a lot. I move it in place by bumping it alternately from the head and footboard.